Flexible Learning Environments have been introduced to the College campus over the past few years. These spaces help facilitate collaboration and project based learning. They provide teachers and students with areas to learn in large and small groups, collaborate and break away for independent study. 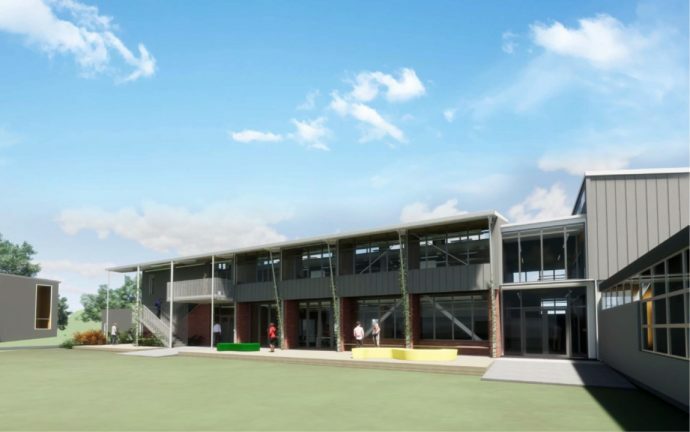 The next stages of campus development include a new block at the rear of the College to be called the McKinnon Building after past Headmaster Ian McKinnon and his wife Jenny. Architects and building planners have worked alongside staff and students to create facilities that will offer flexible learning environments suited for individual study and collaborative group work, adaptable teaching spaces and a leading fabrication lab. Also planned for the new building is a Food Technology Laboratory to allow for its introduction to the curriculum. The girls’ pastoral care facilities will be located in this block with their own Hub like common room. The student environmental committee have held regular meetings with the architects to discuss their thoughts and ideas on features that should be included in the new building to make it as environmentally friendly as possible. The Parents’ Association too will be involved in supporting development of the outdoor space in front of the McKinnon Block and environmental features. These additional flexible learning areas will not be big open spaces but instead flexible areas that help facilitate collaboration and project based learning, while also providing quiet spaces for students to study. We have learnt from the experiences of other schools and aim to provide our students and teachers with flexibility and choice. Construction is currently underway with completion scheduled for the start of the 2020 school year. Ian McKinnon was the Headmaster from 1992 until 2002. During his tenure as Headmaster he made significant changes to the College establishing it as the well-regarded educational institution it is today. An official opening ceremony and reunion will be held once the building is complete where the College looks forward to welcoming Old Boys and the wider community from the 1992-2002 era to the College to celebrate with Ian, Jenny and their family, to connect and to share in the future of the College.